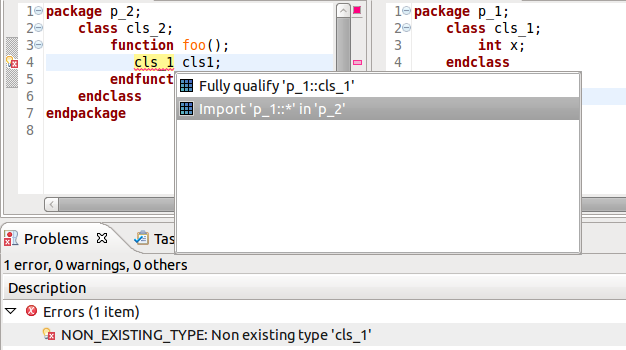 An error is triggered when accessing a type declared in a package which was not imported in the current scope. Place the editor cursor on the error's line and press Ctrl + 1, select the Import ... from the list of quick fix proposals and press Enter. An import::* statement is added at the beginning of the enclosing package (or module, program, etc.). Note: When the missing type name is provided by multiple packages, all possible imports are proposed. Note: If there are multiple nested modules where the import statement could be inserted, all possible insertion points are proposed.